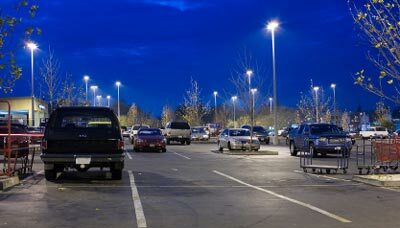 There are many reasons why a company may choose to retrofit parking lot and security lighting, and the process is much simpler than it may seem at first. For most companies, illumination costs makeup about 25 percent of all utility expenditures, so any gains in efficiency can make a huge impact on finances. This can be particularly helpful in older buildings where the fixtures may be several years or even decades old. Fortunately, there have been significant advancements in illumination technologies in the last 20 years, including top of the line LED systems. Why would a company decide to retrofit parking lot and security lighting systems? Systems that rely on incandescent fixtures or some types of gas discharge lamps are appropriate in some cases, but they cannot compare to the efficiency that LED systems produce. LED fixtures are often the preferred choice for businesses considering an update, and they are unparalleled in their ability to reduce utility expenditures. LED fixtures are available in a variety of designs, including brick LEDs for large open areas, low watt gooseneck designs for decorative touches, and wall mounted fixtures for additional safety. LED fixtures can also be installed over existing interior illumination systems, and this can provide a unique set of benefits. LED technology is extremely reliable, and each diode lamp can provide roughly 50,000 hours of performance before it needs replacing. Unlike other fixtures, which use basic chemical reactions to create illumination, LED fixtures utilize highly sophisticated semiconductor technology to emit a constant, full spread of radiance. These fixtures can be customized to provide a range of color tones, including the bright white hues that improve color rendering and safety. Updating an existing lighting system can also earn significant tax rebates and incentives for the company. New fixtures can also increase asset value, according to Energy Star. Their studies found that every $1 spent on fixture improvements could add up to $3 back to the company in increased asset values. How can LED Spot help a business retrofit parking lot and security lighting systems? Prior to any installation, LED Spot builds a precise model of the installation site using photometric and design technologies. This allows us to visualize the project before installation begins, ensuring that the business owner gets the exact setup they are looking for. Updating an existing set of fixtures offers unique challenges, like improving electrical infrastructure or accounting for suboptimal placement of existing fixtures. The professionals at LED Spot have more than 30 years of experience installing new and retrofitted illumination systems, so we are prepared for any obstacles that may arise during an installation. Why Should Apartment Complexes Retrofit?